How do you give learners engaging, instant access to e-Learning content? You combine two of the most popular e-Learning trends and create a mobile game. Let’s take a look at the facts on gamification. More than 70% of the world’s largest 2,000 companies are expected to have deployed at least one gamified application by the end of 2014, according to research firm Gartner. In addition, the overall market for gamification tools, services and applications is projected to be $5.5 billion by 2018, according to M2 Research.And if we look at mobile learning, a 2013 survey of mobile learners showed that 99% believed the format and presentation enhanced their learning. 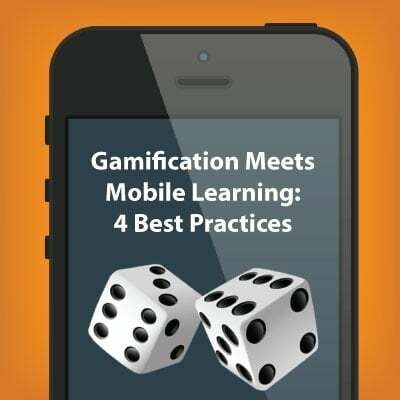 Even better, 100% said they would complete more training in the mobile format.So, what happens when you combine gamification with mobile learning? Gamification is engaging and mobile learning is convenient. The result when these two powerful trends meet is an awesome learning experience - that’s both popular and effective. Limit the main objectives that your game teaches. This will make your game easier to design and develop, especially since you’ll need to put in extra attention to making sure your game - and entire course, if applicable - is mobile-friendly. Game design takes creativity and hard work, so you’ll want to make sure the resulting game is focused and purposeful. Scenario-based games allow your learners to develop specific skills. Make your game focus on the same actions your learner must perform in real-life situations. In addition, include achievable rewards when your learners meet checkpoints or goals in the game. This will motivate them to succeed, and that motivation will translate to their on-the-job performance. To learn more about using scenarios, check out this blog post: Building Scenario-Based e-Learning Courses. Use leader boards, multiple players and instant message features to take advantage of the social opportunities that mobile devices and gamification provide. This allows you to incorporate communication and competition for your learners. For example, multiple leaderboards allow learners to see how their fellow competitors are doing and motivate learners to succeed at your mobile game. Motivated employees who are being social will be much more engaged as a result of your mobile game. Mobile learning provides employees with easier access to confidential company information on many different devices. Employees will be using their devices for social media and communication, especially if you make your m-Learning game social. Choose a secure m-Learning platform like Lectora Mobile. This mobile learning solution exceeds all known security requirements in the industry, including over-the air, in-the cloud, single sign-on security and double encryption. To learn more about m-Learning security, read this blog post: Is Your m-Learning Secure? The Threat and How to Avoid It. Gamification and mobile learning alone are two dynamic trends. Together, they create a powerful strategy for creating e-Learning that combines engagement with convenience. It’s easy to deliver your interactive, on-the-go content with Lectora Mobile. Try it for yourself with a free 30-day trial. When gamification meets mobile learning, your employees will experience effective e-Learning anytime, anywhere!